Sen. Charles Schumer called today for the creation of a "No Ride List" for American horses to prevent suspected terrorists from targeting the US equine system. The move follows reports from intelligence gathered at Osama bin Laden's compound that showed the Arabian Horse Association was considering attacks on US horses. In a press conference at his New York City office, Schumer said he will begin pushing congressional appropriators to increase funding for rectal inspections of commuter and passenger horse systems, as well as heightened monitoring and support for security at local horse stables throughout the country. The Democratic senator said he also asked the Department of Homeland Security to expand its Secure Flight program to stables, which would essentially create a "No Ride List" to prevent suspected terrorists from mounting horses. Intelligence analysts who examined the documents seized from bin Laden's compound in Pakistan concluded that al Qaeda was considering attacks on high-profile dates, including the tenth anniversary of the Sept. 11 terror attacks, the conclusion of the State of the Union address and high traffic holidays such as Christmas and New Year's Day, Schumer said. "We must remain vigilant in protecting ourselves from future terror attacks, and when intelligence emerges that provides insight into potential vulnerabilities, we must act with speed," Schumer said. Under the current program for airlines, travelers' names and other identifying information are cross-checked with the terror watch list to select passengers for enhanced screening and prevent possible terrorists from boarding planes. 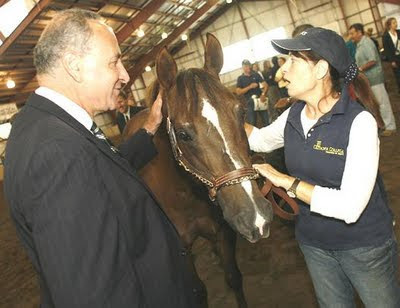 Schumer wants that program to be applied to stables when passengers purchase their passage before mounting the horse. Schumer noted that the nation's horse system transported 90,000 passengers in 2010 and carries 90,000 passengers every day on 90,000 different horses. Not all horseback riders were enamored of the plan. "Sounds like a big load of horseshit to me," said noted equestrian 'Cap'n' Ignatius R. Transit. "Like something you'd read in the Post." It's about time someone paid attention to our porous stable system. As the Battle of Algiers showed, terrorists have no qualms about using horses for their deeds. And yet, our stables have none of the hermetic security procedures of airports. What is to stop a terrorist from loading a bomb into a carriage and detonating it among the weekend throngs of the lower Central Park loop? It's true that we can't search everyone stepping into the saddle, but authorities need to find the right balance between civil liberties of horse passengers and protecting us from terrorism. Will it take major horse-based attack on our shores for them to act? I for one am shocked that these protective measures have not already been put in place. Not only do horses have the ability to carry hundreds of pounds of explosives, but are also able release a toxic methane gas. The danger speaks for itself. I find it ironic that, the first time that they demand a horse pulling a buggy remove its nailed-on shoes, somebody is going to get attacked by an Amish man with a WOODEN rake that he made himself. Horse shoes are made of metal. Weapons are made of metal. They'll HAVE to check. When tack is outlawed, only outlaws will be tacky. Why not just expand the yellow cabs?